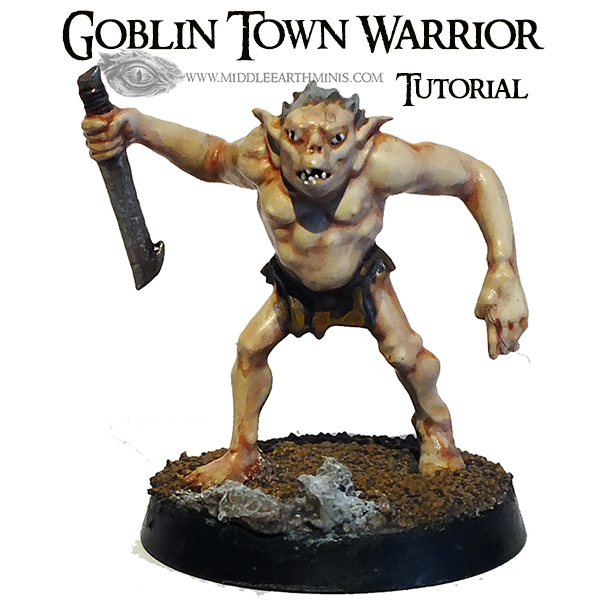 In this post I will make a tutorial about how to paint this mean little guy, a Goblin Town warrior from the Escape from Goblin Town box set (the Hobbit sbg). "These creatures that Men now name Goblins are dwellers in darkness, who were spawned for evil purposes.In Earlier days, they were called orcs. Black-blooded, red-eyes and hateful in nature, though they are now reduced to beings committed to minor deeds of mischief, they were once a race bent on terrible tyranny." Though I believe I found the right colour scheme for these goblins (a matter of personal taste), I don't feel particularly proud of this model. Maybe my painting "now and then" spirit is becoming an inconvenient, since I feel I could do a much better paint job. But well, water under the bridge, and looking forward. For the plus side, I'm currently painting the Goblin King (following the same colour scheme as this goblin) and it is starting to look great in my opinion. Now, before we get to the tutorial, there's something I'd like to clarify. You'll notice that I have censored the brand logos in the bottle labels (and I'll keep doing it now on). This is because I'm not sponsored by any brand and this site isn't supposed to be a free advertisement spot (though evidently you all know the brands that I'm using). So, the paint bottles that appear uncensored were sent to me a few years ago for reviewing purposes and, since at that time I was nowhere close to the painter (and image editor) that I currently am (thus the reviews might not have matched the expectations, for my part at least...), I decided to keep the labels untouched as a manner of thanking the brands that sent me their products. The method followed is the same as the previous tutorials. 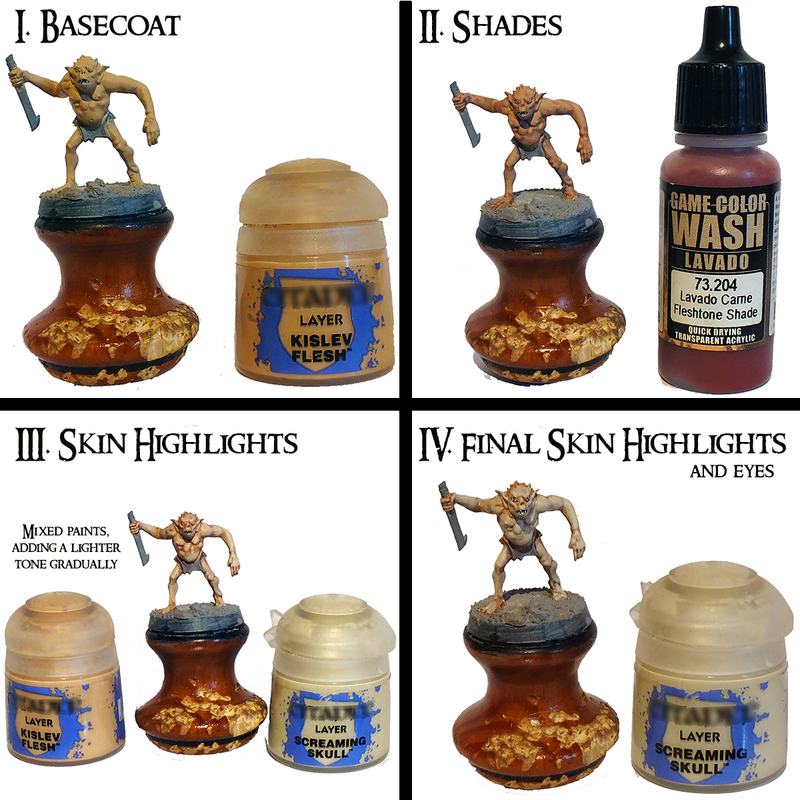 For the 3rd step I just mixed in 2 or 3 times the lighter skin tone to the darker one to achieve a brighter colour. The wet pallet is an excellent medium for doing it! and that it is spread across the whole part you wish to glaze. Glazing isn't washing! as well as to weather his weapon. I decided to not give any highlighting to the sword because I liked the look of it after the ink wash. I hope you guys enjoy this little article. 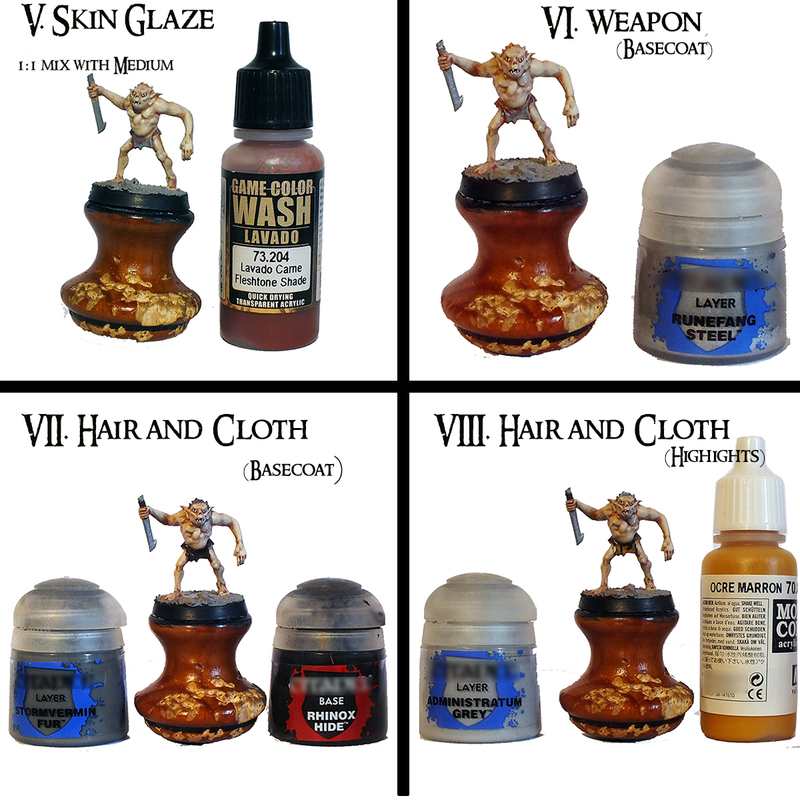 Keep on Hobbying and Wargaming happily ! Nice tutorial and very well painted goblin! Nice and smooth shades and highlights! Great job! 116th - The End and the Begining!